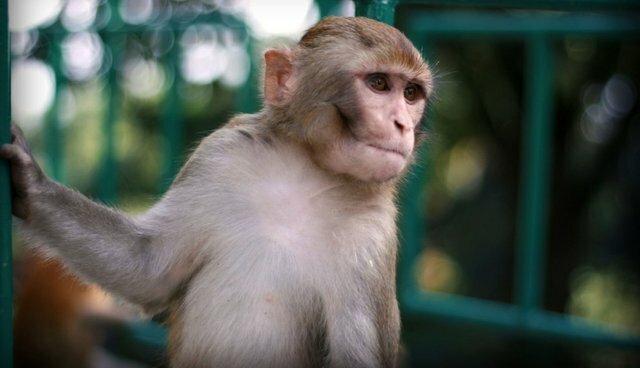 An investigation by Animal Defenders International (ADI) has revealed disturbing training methods and animal abuse at the so-called "Monkey School" in South Korea -- a show in which monkeys are trained to perform onstage and act as though they are in a school classroom. ADI's investigation revealed one monkey dead in a cage and the disturbing living conditions in the other tiny enclosures. They also recorded handlers training monkeys to walk upright by tying their hands behind their backs and hitting or scaring the animals. During the Monkey School's shows, the animals are made to ride on a motorbike, do handstands, jump through hoops and respond to commands. You can see footage of the training and the shows here -- but be warned, the footage is very disturbing. "All aspects of life for primates at Monkey School are appalling, from the inadequate and atrocious housing conditions, the physical and psychological torture, to the lack of empathy and respect shown by the staff," said Sharon Shaw, Director of Lakeview Monkey Sanctuary in the UK. "The poor animals who are unlucky enough to live there endure a barbaric, unnatural life." Though animal rights laws in South Korea are weak, ADI is asking people to help end the Monkey School and other animal shows like it. ADI is calling for US citizens not to attend shows with live animal performances, to contact their Member of Congress to support legislation to end the use of wild animals in circuses and sign the petition to end wild animal performances in South Korea. You can sign ADI's petition here.